Built to some of the highest construction standards in the industry, Our patios are made to stand the test of time and look great doing it. Whether they are enjoyed by the grandkids or increasing the value of your investment property, our patios are guaranteed to last. Our patios are available in a wide variety of shapes sizes and materials, listed below are some of our most popular sizes and materials. If you have something different in mind let us know and will can get you a free estimate. A great place for BBQ on a budget. Imagine 100 square feet of permeable patio, perfect for grilling or lounging. Choose from a variety of colors and paving patterns to compliment your home and new landscape. Built in the European style, our pavers sit on an 8 inch bed of compacted rubble and granite sand that acts as a shock absorber for frost heave or variation in ground levels over time that can crack standard concrete sub-bases. This more flexible base has less strength than concrete pad, but it is also much less brittle, its cheap and easy to maintain, and it will never crack. Old world charm and craft right outside your back door. Our mid-range patio is a great option for a comfortable, hard wearing, patio in the modern style. Made from geometric sections of locally quarried limestone, this patio offers a spacious surface area perfect for a grilling or lounging. Choose from a wide selection of colored grout for an accent to match your homes color scheme, or gravel filled joints to keep the surface permeable. Protected with a long-lasting sealant, your patio won’t be victim to the usual staining over time all too prevalent in urban limestone. The squared stone sections look great against modern architecture, but with a warmth and comfort that concrete can’t always achieve. Transform your lifestyle with a whole new space to enjoy. Our deluxe Oklahoma flagstone patio will give your backyard a new life with the space and strength for anything! From hot tubs to outdoor kitchens to ping pong tables, this patio can accommodate any outdoor luxury or structure with room to spare. Each stone is hand cut and shaped by our team of expert masons to fit together like clockwork, with an eye for detail that is all too rare in current construction standards. With tiny joints and sleek black mortar, our Oklahoma Flagstone patios are built to a standard that is hard to surpass. The beautiful natural variations of the stone will match almost any color scheme, and our Wet Look sealant keeps them protected and looking fresh for years to come. Built on a steel reinforced 6 inch concrete pad, your new patio will be enjoyed for generations. Keep Austin Homey! 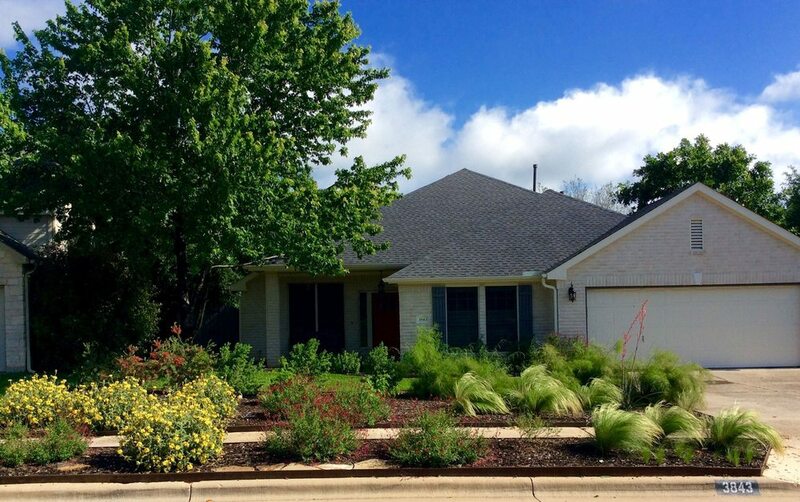 Our traditional Central Texas style with a heavy focus on low maintenance Native planting and comfort. No water, No fertilizer, No Mowing, No problem. Install it and forget it. New in town? Your yard needs shade and sooner is better than later. Summer is coming. Traditional white picket or something more modern, perhaps? We can do it all! Good fences make good neighbors. From smores with the kids to autumn bonfires, nothing brings people together like a campfire. Better than TV! Fresh salsa, Homemade Peach cobbler, Blackberry pie. They all start with Texas native fruits and veggies. Yard to Table. Ponds, fountains, and waterfalls. You can’t beat the sound of running water for relaxation. Keep that Chi in balance.